Them and me. And possibly some friends. I just had the best plain plantains, courtesy of my neighbor, courtesy of me taking care of her mail while she was away. It may actually be a week or two, since I’ll be at a conference for part of next week (Baltimore! ), and according to my neighbor what you do is buy the plantains green and then let them ripen for 3-4 days (they should turn yellow). But this is definitely happening. Between now and then, I’m sure I’ll look up some recipes (if you have a good one, let me know! 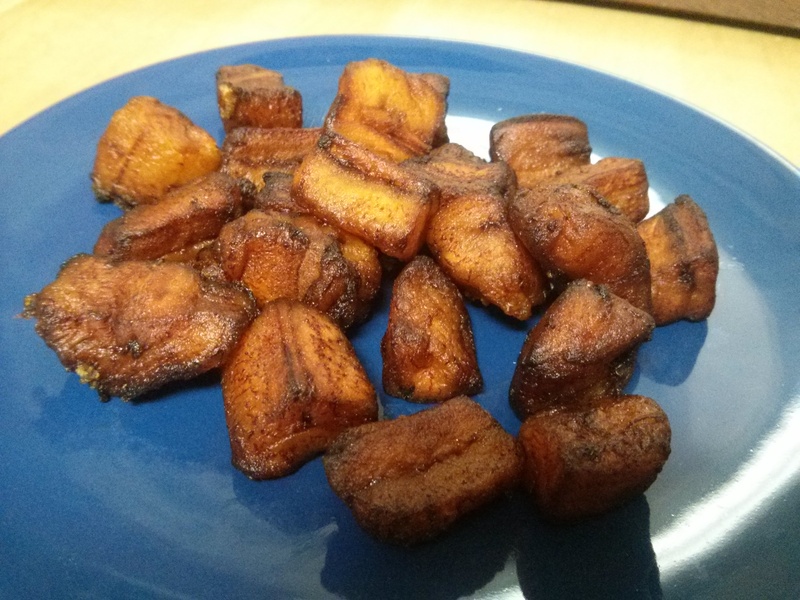 ), but this is how she does it: after the plantains are ripe, you cut them into small pieces and fry them for about 5, not more than 10 minutes in oil. The oil (she said she used a palm/vegetable oil mixture from Whole Foods) should be hot enough so it sizzles a bit when you add the plantains, and you use enough oil to cover the pieces. “I don’t usually fry things and use a lot of oil like that,” she said, “but this is way to do it.” I told her I wasn’t a big fryer either but was going to do it. She added that another thing you can do is marinade the plantains for an hour first with salt and ginger, and then fry them. Sounds good to me too. It looks like I’ll have at least two recipes going when the time comes. This entry was posted in Uncategorized and tagged food, neighbors, plantains, recipe, vegan, vegetarian on April 23, 2015 by dave379.